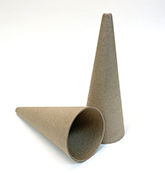 Craft Cone is composed of sturdy paper fiber and measures 7"H.
Ideal base for angels, dolls, treetop ornaments, trees, etc. Measures 7"H x 2-3/4" diameter at the base x 1/8" thick. Heavy paper fiber with hollow core. 7"H x 2-3/4" dia. base. Please observe minimum of 5 Craft Cones.